It’s not surprising that this military sounding Indica has a murky military history. As legend goes, back in Mississippi in the 60’s the CIA, FBI and gods knows who else where officially growing the most potent super strains under lab conditions to test the affects on the human condition. After a shady deal was apparently struck with one of the research guys, this Indica began to see the light of day and the strain known as G13 has become a well known addition to the family. True or not, it makes for a good campfire tale. THC levels are high at around 20%, and although this can be a sleepy strain, it does poses a somewhat uplifting high. Dark purple foliage and faded green buds are evenly covered with sticky resin. Aromas are very pungent with woody, earthy and piney mixed with sweet tones. The smoke is quite a harsh but the fruity and tangy nature of G13 leaves a sweet after taste. An overall body buzz with strong and long lasting effects of approximately 2 -3 hours await the smoker of this clone who is left with a high that is both creative and active as well as clear headed. Perfect for daytime usage with little to no signs of fatigue. This is highly recommended for use linked to stress, depression and insomnia as well as anxiety due to its confident yet relaxed high. Allegedly G13 was decreed to be the most stable of the 23 clones that it came from but the one thing you will get from G13 is a strong appetite. G13 can be grown both indoors and outdoors with an 8-9 week flowering period. The yield is moderate and gardeners of an intermediate level should be comfortable growing this. 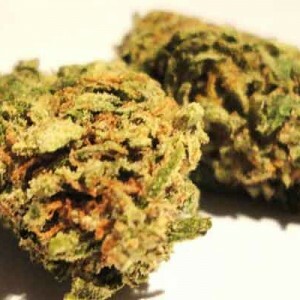 Buy High Quality and Original G13 (Indica) Strain Weed online at Marijuana Floor.